The easiest way to tell is the red sole. It should be vibrant red, shiny leather, with a slight curve to the edges. It shouldn’t be plastic, resin or flat. When worn, it will look like scruffed-up leather. The shoe bag should be high-quality felt with a crisp black logo and the word ‘Paris’ on the bottom right. The logo doesn’t necessarily have to be centred. Check the type is the correct shape compared to the logo. It will have a black drawstring at the top. The logo on top is crisp and white. Check the type is the correct shape compared to the logo. A real Louboutin box will have a label showing the size, style and colour. Check the font is evenly spaced and has correct spelling. A real Louboutin has a logo printed in to the insole, it also may have the word ‘Paris’ below. Check the original logo and ensure that the font is the same. The print should be, not smear, overlapped or thick. The insole should be neat with no gaps where joining the shoe upper. 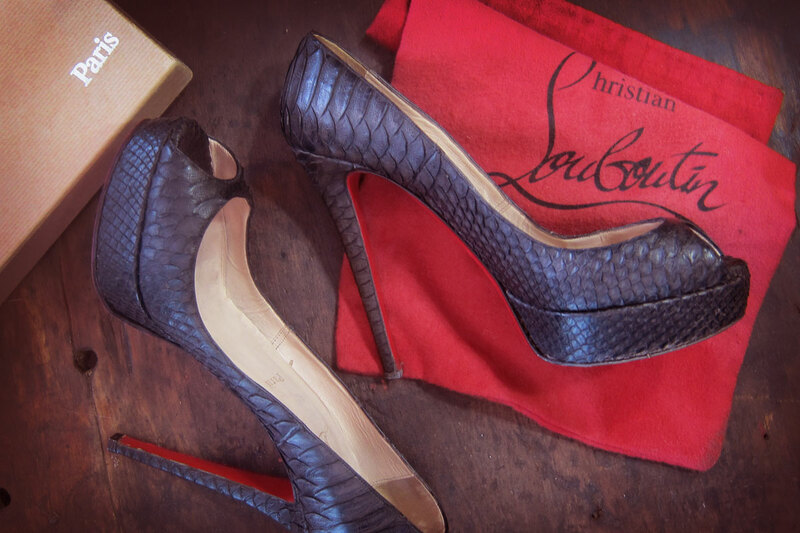 A Louboutin shoe should be of the highest quality. There should be no missed stitches or heavy stitching. It should be straight and even. A real pair of Louboutins will have a receipt of purchase. Real Loboutins DO NOT have a card of authenticity. The card is a sure giveaway of a fake product. The sole will be stamped with the ‘Christian Louboutin’ logo, then ‘MADE IN ITALY’ in capital letters, and then a size. The shape with ‘VERO CUOIO’ was used in the shoes made before 2007. The half sizes are always 1/2 and not .5. Look closely at the attention to detail, like the edging of the soles, or the joins. Real Louboutins will be smooth and look neat. Fake shoes will show gaps and glue. If the shoes have embellishments, they should be evenly spaced and attached well. Louboutins will use only the highest quality leather and fabrics, they won’t have a palsticy smell. Louboutin shoes have an elegant and sleek silhoette. They won’t look clunky, and the joins should flow. If the design, or the curves are not drool-worthy, there’s a good chance they are fake. Research the real shoes and compare the ones you need to authenticate… quite often there will be small difference that will tell you they are fake. If you are considering purchasing secondhand Louboutins, it is a good idea to ensure you can get your money back if they are fake. EBay or Paypal can do this, but, by buying at markets, Gumtree or on Facebook Marketplace means that if you buy a fake pair of shoes you have no way of getting your money back. A clean up/reconditioning of the upper shoe. For a list of Baxter & Black ladies shoe repairs, go here.